W kwietniu 2019 ma się odbyć lot kosmiczny astronauty z ZEA. Przygotowania podstawowego kosmonauty i rezerwisty mają zacząć się w sierpniu 2018. Исполнительный директор по пилотируемым космическим программам Госкорпорации «РОСКОСМОС» Сергей КРИКАЛЕВ и генеральный директор Космического центра Мохаммеда бин Рашида доктор Юсуф Намад АЛЬ ШАЙБИНИ подписали соглашение о начале оказания услуг по полёту на международную космическую станцию (МКС) одного космонавта ОАЭ. Подписанное соглашение является предварительным, окончательное соглашение будет заключено до конца августа текущего года. Предметом основного соглашения и настоящего предварительного подписанного соглашения являются услуги по отбору, подготовке к полету и полета одного космонавта ОАЭ на МКС. Полет продолжительностью около 10 дней состоится в апреле 2019 года. Старт будет осуществлен на транспортном пилотируемом корабле (ТПК) «Союз МС-12». Возвращение космонавта ОАЭ запланировано с экипажем ТПК «Союз МС-10». Подготовка первого космонавта ОАЭ и его дублера начнется в августе 2018 года. 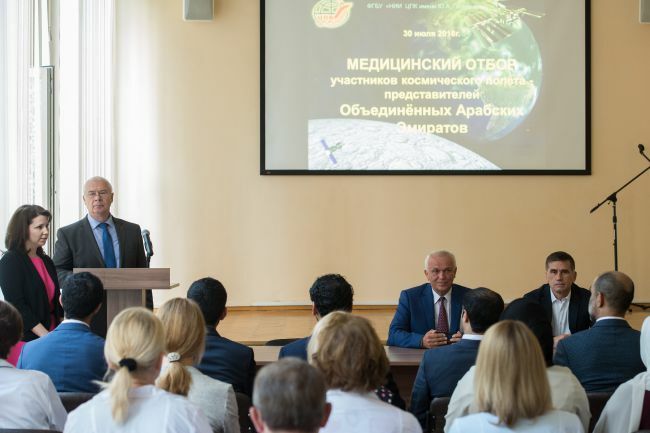 The UAE and Russia have signed an agreement to send the first Emirati astronaut to space to participate in scientific research as part of the Russian space mission to the International Space Station aboard the Soyuz-MS spacecraft. Sheikh Mohammed bin Rashid Al Maktoum, Vice President and Prime Minister of the UAE and Ruler of Dubai, said that sending the first Emirati astronaut to space will herald the beginning of a new era for the UAE. His comments follow the deal between the Mohammed Bin Rashid Space Centre (MBRSC) and The Russian Federal Space Agency (Roscosmos), a statement said. Sheikh Mohammed added: “The UAE has signed a historic agreement to send the first Emirati astronaut to the International Space Station. The journey that we began 12 years ago is beginning to bear fruit. “Our vision to develop the national space sector is being realised with the development of a spacecraft, the construction of our first local satellite manufacturing facility, the training being given to Emirati astronauts, and the launch of a comprehensive scientific and research programme." He also said that the agreement supports the objectives of the UAE Centennial 2071 which focuses on the development of futuristic sciences across various sectors including innovation, space, engineering and medicine. The agreement also provides an impetus for advancing the UAE’s future space ambitions which include building the first inhabitable human settlement in Mars as part of the 2117 Mars project, he noted. Sheikh Hamdan bin Mohammed bin Rashid Al Maktoum, Crown Prince of Dubai and chairman of the MBRSC, said that the first Emirati astronaut will travel to space within a year of the UAE Astronaut Programme creating a final shortlist of candidates as part of the National Space Programme. Four candidates will be selected from the 95 shortlisted applicants (of which 75 are males and 20 females) aged between 23-48 years, as part of the UAE Space Programme announced in April 2017. The Mohammed Bin Rashid Space Centre announced that 95 out of the 4,022 applicants have been shortlisted for the UAE Astronaut Programme, part of the UAE National Space Programme. It aims to train and prepare a team of Emiratis to be sent to space for various scientific missions. The programme was announced by His Highness Sheikh Mohammed bin Rashid Al Maktoum, Vice President and Prime Minister of the UAE and Ruler of Dubai, and His Highness Sheikh Mohammed bin Zayed Al Nahyan, Crown Prince of Abu Dhabi and Deputy Supreme Commander of the UAE Armed Forces, in April 2017. The shortlisted applicants are 75 males and 20 females of ages between 23 to 48 years, from across the UAE. The list includes 64 candidates under the age of 35 and 31 candidates over 35 years of age. They hail from diversified educational and vocational backgrounds including civil aviation, air force, medicine, STEM and education. Hamad Obaid Al Mansoori, Chairman of the Mohammed Bin Rashid Space Centre, said: "The UAE is moving rapidly in space science and research due to the unlimited support of our wise leadership. We are delighted by the volume of entries from a highly qualified caliber of Emiratis. This confirms the ambitions of the UAE nationals who are dedicated to follow the country’s approach to explore space and support the vision of our wise leadership to prepare national cadres to enrich scientific progress and serve humanity through making further achievements in space exploration. This contributes to achieving the ambitious aspirations of reaching a national economy based on knowledge, innovation and creativity, in addition to enhancing the UAE’s competitiveness and leadership as a global hub for space science." "The qualified candidates represent the future of the UAE and reflect its generations’ aspirations to shape a future that tells the story of the country’s glorious legacy. In this race to the space, they reaffirm our leadership’s plans for the youth since the formation of the union by our great leaders and until this day. With this motivating spirit we move forward together to achieving the UAE Vision 2021 and the UAE Centennial 2071, confident that the UAE astronauts will be our ambassadors for a bright future at times of the Fourth Industrial Revolution," he added. Al Mansoori highlighted that the UAE Astronaut Programme is the first astronaut programme in the Arab world aimed towards developing skilled and capable Emirati astronaut corps and sending them out to carry out scientific missions. They will also serve as ambassadors for the UAE in space exploration, and promote scientific culture, passion for exploration, and innovation among new generations. The objectives of this programme are aligned with the Mars 2117 strategy which sheds light on the challenges and areas of interest of human space exploration. From his side, Yousuf Al Shaibani, Director General of the Mohammed Bin Rashid Space Centre, said, "The UAE Astronaut Programme contributes to achieving the national strategy which aims to train and prepare a future generation of space explorers according to the highest international standards. The Mohammed Bin Rashid Space Centre looks forward to having a national team of astronauts who can achieve the UAE’s ambitions in this field,"he added. Al Shaibani noted that, during the last period, the ‘Selection Committee’ worked relentlessly to carefully review and evaluate applications according to the highest international standards. The Committee shortlisted over 200 candidates who went through psychometric test that lasted up to 6 hours and focused on a number of assessments including the applicants’ intelligence (IQ) score, emotional stability, adaptability and many more competencies. These assessments were identified as necessary for individuals working and living in the International Space Station (ISS). After the test, 95 candidates were selected to be interviewed and physically, psychologically and scientifically evaluated. The final phase will conclude this year with the selection of the top four candidates and two reservists who would pass all the previous stages. The team will be the first UAE Astronaut Corps and will join efforts with other astronauts to carry out scientific missions that will complement the research needed to prepare future space explorations, find solutions to many challenges, enrich human knowledge and the scientific community. The finalists will undergo an intensive training programme, consisting of several stages according to the highest international standards. It will start with the basic training stage, during which candidates will learn about the objectives and plans of the programme and learn the basics of scientific disciplines, including space engineering and space science. Candidates will also have to learn Russian and train in space science and research. They will then move on to advanced and intensive training, during which participants will learn about the maintenance and management of loads, as well as a range of skills including robotics, navigation, medical aid and resource management. Upon completion of this stage, the astronaut will be eligible to participate in missions to the ISS. The first Emirati astronaut will be sent to space in the coming years, and the rest of the team will follow to ISS. The UAE Astronaut Programme is funded by the ICT fund of the Telecommunications Regulatory Authority (TRA). Launched in 2007, this fund, which is the first of its kind in the Aab world, aims towards supporting research and development within the ICT sector in the UAE, helping it to grow into a nationally significant industry with a leading place in the world. 9. kandydatów przybyło do CPK , gdzie przejdą trzytygodniowe selekcyjne badania medyczne. Pozostanie dwójka do dalszego szkolenia. В Россию прибыла делегация Объединённых Арабских Эмиратов (ОАЭ), в состав которой вошли представители Космического центра Мохаммеда ибн Рашида и девять претендентов для полёта в космос с различными научными миссиями. Pojawiła się plotka, że dziś wybrano astronautów z ZEA. Nie mam jednak nigdzie żadnej informacji kto to taki. Czy ktoś może potwierdzić albo zaprzeczyć? The announcement of our first two Emirati astronauts heralds a new era in our nation’s history. Hazza Al Mansouri and Sultan Al Niadi will raise the UAE flag amongst the stars. Congratulations to the people of the UAE for this great achievement. The UAE on Monday named the two Emiratis who will be the first to go into space to the International Space Station following an extensive search for astronauts. Sheikh Mohammed bin Rashid Al Maktoum, UAE Prime Minister, Vice President and Dubai Ruler, tweeted that he is proud to announce the success of Hazza Al Mansouri and Sultan Al Nayadi. He said he hoped the duo would "raise the bar for an entire generation", adding: "We have the only Mars probe program in the region; our satellite industry has realised its full potential; we have UAE astronauts; we have a space industry worth AED20bn & we have aspirations without limits... When given the opportunity, Arabs can reach for the stars." Thirty-four-year-old Hazaa Ali Abdan Khalfan Al Mansouri has a Bachelor’s Degree in Aviation Science and Military Aviation from the Khalifa bin Zayed Air College, has 14 years of military aviation experience, and has completed training programmes both inside and outside the country. In 2016, Al Mansouri qualified to be an aeronautical pilot and now pilots an F-16B60 aircraft. Thirty-seven-year-old Sultan Saif Muftah Hamad Al Niyadi has a PhD in Data Leakage Prevention Technology from Griffith University in Australia that he had obtained in 2016, as well as a Master’s degree in Information and Networks Security from the same university, a Bachelor’s degree in Electronics and Communication Engineering from Brighton University in the United Kingdom, UK, and completed a general education programme in IT in the UK in 2001. 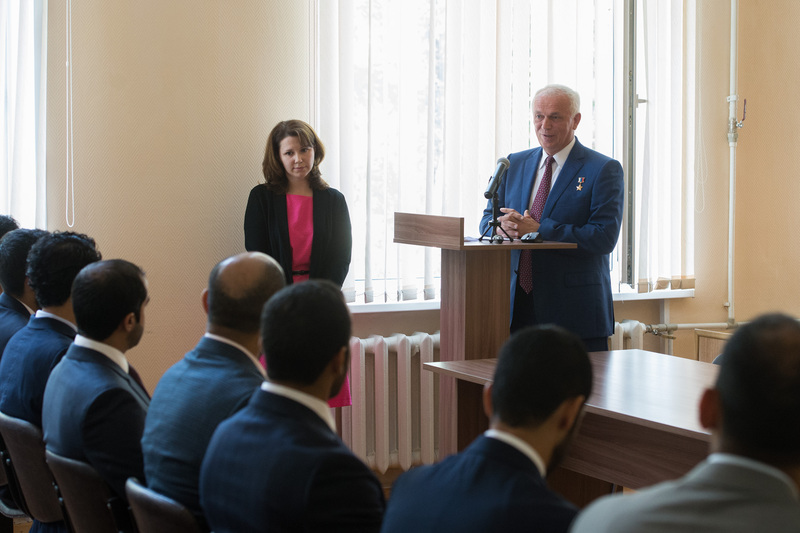 The final two were chosen after a shortlist of nine candidates competing to become the UAE’s first astronauts underwent tests recently in Moscow. The tests were conducted over the course of three weeks at the Gagarin Research and Test Cosmonaut Training Centre and at the Institute of Biomedical Problems at Russia’s State Scientific Centre. The two astronauts from the Emirati corps will be trained in Russia, one primary and one backup. One of them will be joining a crew of Russian commander and an American astronaut in Soyuz MS-12 spaceflight which is planned to launch to ISS in April 2019. The other will receive extensive training for future long duration space missions. Hamad Obaid Al Mansouri, chairman of the Mohammed bin Rashid Space Centre, also tweeted: "This announcement is the beginning of a new phase and a milestone for our beloved nation and the young people of the nation who aspire for a brighter future; it is a privilege and pride to succeed in the Mohammed bin Rashid Space Centre in delivering the ambition and aspirations of the UAE youth Into space." Yousef Al Shaibani, director general of Mohammed bin Rashid Space Centre, added: "We have always had faith and certainty in the abilities and competencies of the sons and daughters of the nation, and in light of it we launched the most important and challenging in the history of our beloved nation, which has surpassed the achievements and successes on the ground to look for challenges and stakes in space." The Mohammed bin Rashid Space Centre launched the Emirates Astronauts Programme in December 2017 and created an e-registration portal for those who aim to be the first Emirati astronaut. (...) Dotychczas tylko dwóch Arabów odbyło lot kosmiczny. Pierwszym był Saudyjczyk Sultan Bin Salman Al Saud, który odbył tygodniowy lot na pokładzie wahadłowca Discovery w ramach misji STS-51G w 1985 roku. Jednym z celów misji było wyniesienie satelity Arabsat-1B. Obecnie pełni funkcję ministra ds. Turystyki i Dziedzictwa Narodowego. Około dekadę temu również Jordania rozważała wysłać własnego obywatela Sojuzem do ISS. Plan jednak nigdy nie wyszedł poza wstępny etap deklaracji. Czy tyle wystarczy czasu do przeprowadzenia treningu? Jak ma on lecieć jako turysta to powinno wystarczyć. Młodszy ma 30 lat, starszy 37 lat. Rosjanie coś wspominają, że lot ma trwać około tygodnia, więc start może być opóżniony o 3 dni. Zobaczymy jak sprawnie będzie przebiegało szkolenie i który z nich weźmie udział w locie. Pojawiła się wiadomość , że Hazaa Ali Abdan Khalfan Al Mansouri będzie miał o 2 dni krótszy lot. Start Sojuza MS-15 ma się odbyć dwa dni później - 25 września 2019.
ostateczna decyzja który z dwójki kandydatów będzie leciał, a który będzie dublerem ma być ogłoszone w maju. Cała załoga Sojuz MS-15 nadal nie jest ogłoszona oficjalnie! 1) Bin czy bin ? 2) Al czy al ? 3) Al czy an ? 4) W przypadku astronautów z ZEA funkcjonują różne formy imion. Której powinniśmy sie trzymać ? 5) Czy skracanie imion z obszaru kultury azjatyckiej rządzi się skodyfikowaną logiką ?